At one time or another, we’ve all seen him. He is the driver who is so self-absorbed; he is oblivious to the world around him. Traffic rules? Common Courtesy? Not for this driver. He is The Most Important Driver in the World. Here is a closer look at TMIDITW and how you will recognize him. He is in the left lane, looking to make a right turn. You are in the left lane traveling to the store and moving along just fine, thank you. Inexplicably the driver in front of you slows to a crawl, and maybe even comes to a dead stop. Eventually his right turn signal goes on. The driver ahead of you needs to make a right hand turn within the next fifty yards and he did not anticipate it. Now he will inconvenience you and the two dozen cars behind you while he waits for the right lane to clear for him. He is after all, The Most Important Driver in the World. 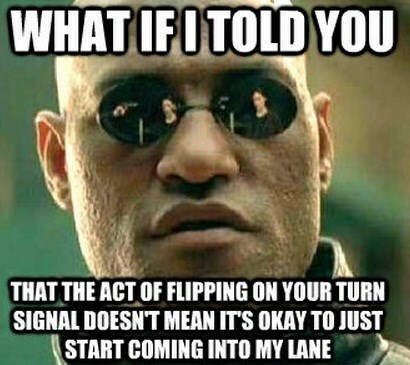 …or the right lane needing to move into the left turn lane. There he is, slowed in the right lane and he obviously needs to not just move over one lane, but two lanes so he can get into the left turn lane. He could have moved over a quarter of a mile back, and he should just go forward and turn around, but no. He is TMIDITW and you, and others will pay for his lack of attentiveness. He is blocking the parking lot waiting for that slightly closer spot. You make a turn into the parking lot and there he sits, blinker on. He is waiting as exiting shoppers approach their car. No matter that it will take five minutes to unload their groceries and back out. No matter that there are empty spots just three rows ahead. He wants THAT parking spot and he will walk no further than necessary, even it causes back-ups behind him. Yep, he IS The Most Important Driver in the World and you have no choice but to wait. You are entering the freeway on the acceleration ramp and you see him in your left-hand side mirror. He is traveling on the freeway’s right hand lane and you know he sees you as you get closer to merge. There is no traffic around him and any reasonable driver would move over to the left lane, making it easier for you to merge. Not TMIDITW. He will not be inconvenienced by such a courteous move. You will have to accelerate rapidly or slow down enough to slip in behind him. You know who he is. You may be stuck behind him as he drives 20 mph in a 35 mph zone, enjoying the scenery or carrying on a pleasant conversation with his passenger. You may come up on him in the left lane traveling at EXACTLY the same speed as the car to his right, blocking your ability to pass. You just need to take a breath and recognize him for who he is. He is The Most Important Driver in the World… and there isn’t much you can do about it except be on the lookout and always practice defensive driving techniques.